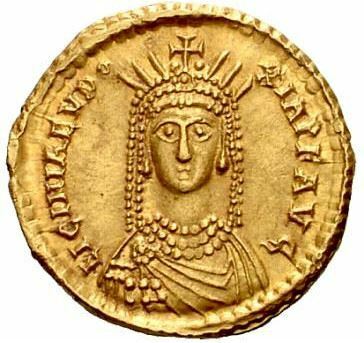 Licinia Eudoxia was a Roman Empress, daughter of Eastern Roman Emperor Theodosius II. In 424, she was betrothed to Valentinian III. He was four years old, Eudoxia only two. They married in 437 AD, and had two daughters before he was killed in 455 AD by two Scytian mercenaries. Since Valentinian III had no male descendants, several candidates to the throne presented themselves. Eudoxia supported Majorian, but Petronius Maximus emerged victorious. Eudoxia was forced to marry him or face execution. Eudoxia would have her revenge, though - she contacted the Vandal king Gaseric, and he captured Rome, executed Petronius Maximus, and took Eudoxia and her daugthers with him to Carthage as honoured prisoners. She remained there until ransomed by Leo I in 462. Eudoxia died of old age in 493 AD, aged 71.